The name Dogajolo was invented by Carpineto’s founders, derived from the Italian word doga, meaning “stave” — the narrow strips of wood used to form oak casks. 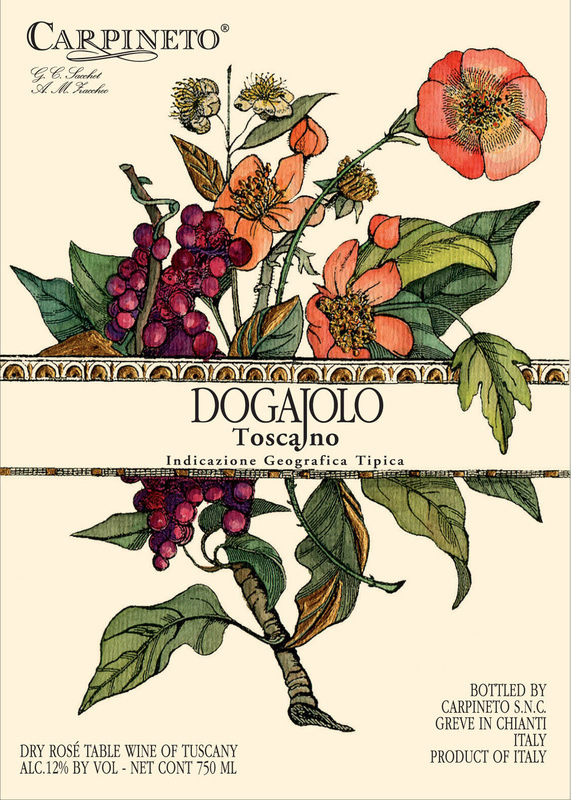 Carpineto Dogajolo Rosato shows vibrant floral aromas of rose and myrtle meet hints of fruit, like apples, currants, and sour cherries. Fermented on the lees in stainless steel, this is a refreshing wine with an invigorating acidity and a clean finish. Watermelon, strawberry, spice and mineral notes ply the linear profile of this pale rose. Persistent finish. Drink now. This rose offers a meaty texture, featuring cherry, currant and mineral flavors. Stays intense as the long, tangy finish winds down. Drink now through 2015. A whole new generation of Italian rose is finally gaining the attention it deserves. This is an exceptionally fresh and clean wine that would pair with smoked salmon, fish carpaccio or insalata di mare.